Lets just get the main thing out of the way... When heard, hell when i saw the big movie poster for 21 Jump Street at a screening for another movie i wanted to go stab someone. I mean really Hollywood did you have to go there? i still said if i got passes for it i would go see it. I didn't see the trailer prior to tonight's screening i wanted to be as untainted as possible and just have my own completely judgmental ideas about it going in. 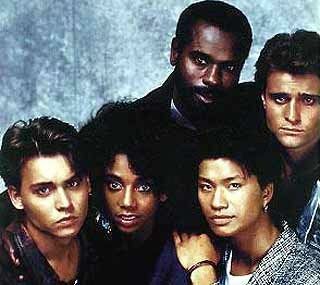 Lets be honest when i see 21 Jump Street this is what i grew up with. Even having Holly Robinson Peete confirm on twitter that she, Johnny Depp and Peter DeLuise had cameos didn't completely sell me on it. This version has a very slimmed down Jonah Hill and Channing Tatum at the back in high school 20-somethings. As much as i hated Channing in The Vow i will openly admit Jenko was made for him. The buff, pretty boy who's hella stupid. Ice Cube plays the angry black man in the film Captain Dickson. The film builds from when Jenko and Schmidt were in high school together, the geek and the jock who did not get along. The both entered the police academy together and become best friends and partners. When their 1st bust goes wrong they get called in by their captain who makes a lot of tongue in cheek references to this being a movie and a remake because hollywood is a bunch of lazy asses and transfers them to Jump Street. Here's what this movie is not; its not a drama, its not an action film. This movie is a straight up comedy. From beginning to end its full of bad puns, dirty jokes, foul mouth cops, weird crunchy kids and i laughed the entire time. There is a lot of making fun of the movie within itself which is pretty interesting that they were willing to poke fun at themselves. I enjoyed it because i like that kind of humor. If you go in thinking this is going to be funny and nothing more you will probably enjoy it as well. This movie is full of f-bombs and the idea of the high schoolers being so different from when Jenko and Schmidt went to school is part of the humor. Its crude, Hangover crude. Accept that and you will be just fine. I give this movie a Redbox. 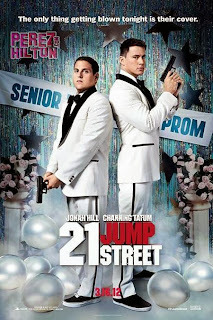 Its not a bad movie but the 21 Jump Street purists WILL NOT be happy. There's no way for you to be you have to completely separate the show from this movie and realize its poking fun at itself not the show. 21 Jump Street is rated R. Its in theatres March 16th.